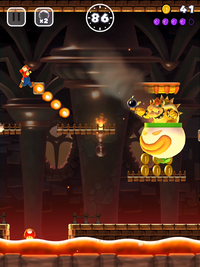 Bowser's Bob-ombing Run (or World 6-4) is the fourth level of World 6 and the twenty-fourth level overall in Super Mario Run. It is the final normal level in the game, and unlocks Princess Peach as a playable character upon completion. The level begins with a single ? Block containing a Super Mushroom. This follows with Bowser himself, who moves around and shoots Bob-ombs around the stage. For the first Pink Coin, the player must stick to the lowest path and collect it near the first Fire Bar. After a long while, the player will approach the second Pink Coin, suspended in midair between a bone platform and a Fire Bar, both on the upper-middle path. The player must then stick to the lowest path and collect the third Pink Coin after a short while. After another short while, the fourth Pink Coin can be obtained by jumping onto a semi-solid platform on the lower-middle path. After an even shorter while, the fifth and final Pink Coin can be obtained by jumping onto another semi-solid platform on the lower-middle path. The player may then defeat Bowser. The level begins with a single ? Block containing a Super Mushroom. This follows with Bowser himself, who moves around and shoots Bob-ombs around the stage. For the first Purple Coin, the player must hit a ? Block at the highest path, near the second Fire Bar. After a moderate while, the player will approach the second Purple Coin, on a bone platform at the lowest path. The player must then stick to the highest path and collect the third Purple Coin after another moderate while. After a short while, the fourth Purple Coin can be obtained by jumping onto a semi-solid platform on the lower-middle path. After an even shorter while, the fifth and final Purple Coin can be obtained by jumping onto the highest path and hitting another ? Block. The player may then defeat Bowser. The level begins with a single ? Block containing a Super Mushroom. This follows with Bowser himself, who moves around and shoots Bob-ombs around the stage. For the first Black Coin, the player must hit a ? Block while jumping between two semi-solid platforms on the upper-middle path. After a long while, the player will approach the second Black Coin, on some Hard Blocks immediately after a Fire Bar on the upper-middle path. The player must then stick to the lowest path and hit a ? Block after a series of Hard Blocks to collect the third Black Coin after a moderate while. After a short while, the fourth Black Coin can be obtained by jumping over a wide gap on the lowest path. After an even shorter while, the fifth and final Black Coin can be obtained by jumping onto the lower-middle path onto some more Hard Blocks and hitting another ? Block. The player may then defeat Bowser. This page was last edited on December 16, 2017, at 06:14.